When considering which kind of fire pit to purchase, you’re going to want to consider some factors such as the various types, fuel required, and size. Where are you going to be using your fire pit and are you going to use it to keep warm, roast marshmallows, or for ambiance? If you’re not concerned regarding the heat you may wish to consider a propane fire pit. Gas fire pits are ideal for accentuating an outdoor area. Propane will burn the cleanest and there isn’t any smoke and you can regulate the amount of heat from the propane tank. This is vital if you’re in a smaller sized area or if you’re near something flammable. You also won’t want smoke from a wood burning fire pit to waft into your house. Propane fire pits can also offer you some colored fire glass that will give you a fun ambiance to your area. Natural gas is also available for many gas fire pits and you’ll want to make sure that a professional, like Ryno Lawn Care installs such units. You don’t get as much heat from a natural gas or propane fire pit as you do from a wood burning fire pit. Be mindful that these are different from patio heaters in that they will have a shield to keep the heat down in the fire pit itself. Remember that wind may also affect the area and can carry embers off which may ignite a fire. Gas fire pits have a BTU rating that helps you to determine how much heat it will put out. When you position gas propane fire pits, keep in mind that you’ll want to know the manufacturer’s recommendations for how close to other items it can be. Keep your distance from structures, your wood, and other things that may be flammable. The general rule is to place such items no closer than 15 feet from any house structure. If space is an issue, consider a different unit that will fit your area more safely. This may be an infrared heating unit. Remember too that enclosed areas such as pagodas may not have the proper parameters for air circulation. Never operate such units indoors where they won’t have proper ventilation. Consider round fire pits that are often seen at a campground. There are various types of wood burning fire pits that are styled like this and they are easy to operate. You can also find these as a tabletop unit. There are various styles and sizes and you can often match them to your decor. Many tabletop models have an under the table tank so it’s not in the way or seen to disrupt the ambiance. They come in different glass colors and decors so it’s super easy to mix and match your decor. This can save you a lot of money in the long run since you don’t have to worry about hiring a professional to install the unit. You simply place it on the table and secure the tank and you’re all set to use it. Since it’s portable, you can move it around your yard, patio or take it with you if you go camping or something. There are numerous sorts of outdoor fireplace and firepits – so take your time and choose carefully. 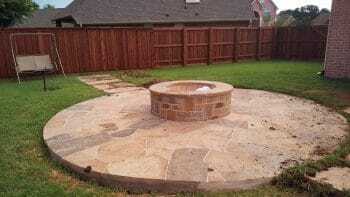 Instead of buying a fire pit from a store, there is a more permanent option to have one installed using brick or stone. This is a more expensive option, but it looks better and lasts longer. It also helps with shielding the wind. You can choose a brick or stone that matches your home for aesthetics. Finally, fire pits can turn your yard into a fun area and they can make it more exciting to invite friends and family over any time of the year. Just remember the safety tips and follow them.